1. In a medium skillet, heat oil over medium heat. Add onion, garlic and jalapeño peppers; saute until onions are soft, about 5 minutes. 2. Add the beans and smash with the back of a ladle or large spoon until softened and heated through, another 2-3 minutes. 3. Remove from heat and stir in pre-shredded Real California mozzarella or monterey jack, sour cream, cumin and cayenne pepper, stirring until cheese is melted. Season with salt and pepper to taste. 4. Transfer to a serving dish and sprinkle Real California cotija cheese on top. Serve warm or at room temperature with chips and vegetables. 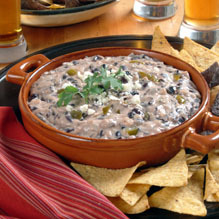 Note: Leftover dip can be refrigerated and reheated in the microwave.